The renowned Scandinavian crime themed television series ‘The Bridge&apos; is currently enjoying its second season on UK TV screens, and many observers, such as The Guardian, are enthusiastically hailing the sensation that this popular drama has caused. &apos;The Bridge&apos; features the Öresund Bridge, the connecting structure between mainland Denmark and Sweden, as an integral part of the plot; but what you may not have realised is that this unique structure owes its real life success to the European Springs team. The Öresund Bridge draws its stability from the high quality compression springs that were installed by our professional engineers. Numerous people were becoming concerned about the severe vibrations that were being experienced by road users who crossed this bridge, and so a solution was in widespread demand. Caused by several stray cables that fluctuated position during adverse weather conditions, the difficulty was ultimately rectified when dampers were fitted to these problematic cables. These dampers, designed by our own in-house team, all contained a compression spring, and were utilised in pairs to manage each cable in question. With this technology in place, this issue, potentially of paramount importance, was completely solved. 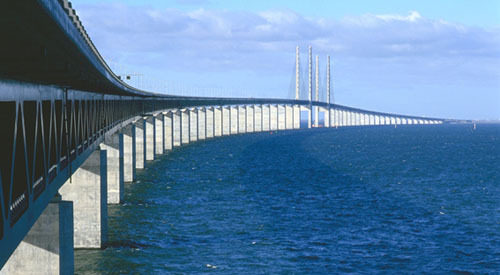 Our custom built dampers used specifically designed weights, pistons and sophisticated laser gauges to regulate the air flow around the cables in question, and the problem of the Öresund Bridge was forever alleviated. Compression springs were instrumental in coming to this efficient resolution, proving that, once again, the world around us really does owe a lot to springs. Here at European Springs, we are very proud to have been a vital component within the success of the now highly recognisable Öresund Bridge. Furthermore, the expertise of our professional team can be easily turned to any of your own requirements for springs and pressings. Having solved the conundrum of the Öresund Bridge, we feel confident that our experienced team can meet your every need, even if you need the most specific and complex bespoke springs imaginable. To find out more about our amazing spring products, please contact us today.